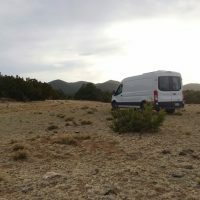 My ratio of nights parked at a Walmart or similar to nights camped in a nature setting is pretty horrific for someone who claims to be out traveling to spend more time in nature. I’ll admit I was a bit more idealistic than practical when it comes to some of the realities of being on the road full time, and the reality is this: Walmart is handy. Walmart is ubiquitous, and I don’t have to plan much, make reservations, arrive to register during office hours of 9-5 and no weekends or holidays, and no matter where I feel like stopping for the night, there is at least one, if not several, within a half hour drive and more or less directly on my route. So at least on traveling days, Walmart often wins. However, some Walmarts are starting to not allow overnight parking because a minority of people have been abusing the hospitality they so generously offer, staying far too long or being a nuisance, dumping their trash or treating the parking lot like a campground and spreading out, socializing in lawn chairs and drinking beer into the wee hours. I realize they don’t allow us there purely out of generosity; Walmart probably gets their money’s worth out of overnighters shopping in their stores, even if not everyone does so every time. But they don’t have to allow us, so to Walmart, formally, I say, Thank You. There are other options for last minute parking. A couple other stores, like Cracker Barrel, allow overnight parking for RVs and similar, and I’ve stayed there several times. It’s not last minute, but when I’m visiting a church for the weekend and call ahead, they have often let me park in the church parking lot for a couple nights, and of course friends and family let me stay on their property while I’m visiting. The problem with camping is that it takes a bit of advance planning, which means that last minute decisions are pretty much out, and that I need a good internet connection to research them, which I don’t always have. Often, places that allow dispersed camping (okay, I need to clarify here, I’m not interested in campgrounds, because one, you have to pay, and two, they completely defeat the purpose of camping in my opinion, which is to commune with nature, not to be packed in with dozens or hundreds of other campers; I want to be out in the open) are difficult to find out about, difficult to get to (that’s kinda the point), have few, if any, online reviews or pictures, so it’s a toss of the dice what you’re going to get when you get there. Some are managed by the state, some the county, BLM, Army Core of Engineers, or other services, and they all have their own regulations about whether you need to register, get a permit, just show up and put a thingy in a box, or nothing, and finding all that out usually requires knowing whom to call, to call during banking hours, and if a permit is required, to show up at an office during said banking hours. Some are regularly patrolled and regulated, some hardly or not at all. On BLM land you can technically camp wherever, but on much of it they allow ranchers permits to graze their cattle, and sometimes the ranchers put up no trespassing signs that look very intimidating even though the guy on the phone from BLM told me “If you see an open gate, just go through it, it’s public land.” Ummm…I lack a certain pair of spherical helpers in that department. I have had several good experiences in these out of the way, open nature campgrounds—called dispersed camping or primitive camping—and that encourages me to try it out more, but it’s a learning process. A few nights ago I had found one of these sites on a website I often use, freecampsites.net, but I had been enjoying the day and taking it slow and by the time I was getting close, it was close to sunset and by the time I would get out there it would have been dark and hard to look around to see what I was getting myself into, where would be safe to park, who else might be around, etc. so instead I hunkered down at the Walmart. I was disappointed, as I had been doing that a lot lately and am hungering for some open land, so the next morning I parked at the nearest McDonalds—thanks for your free Wi-Fi—and found Tuttle Creek State Park. 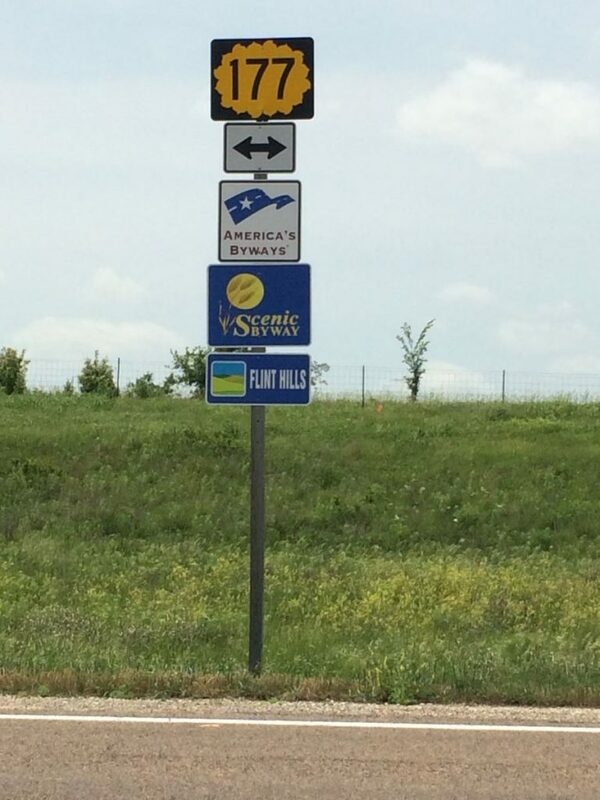 The lake here is called, get this, Tuttle Creek Lake. Really. 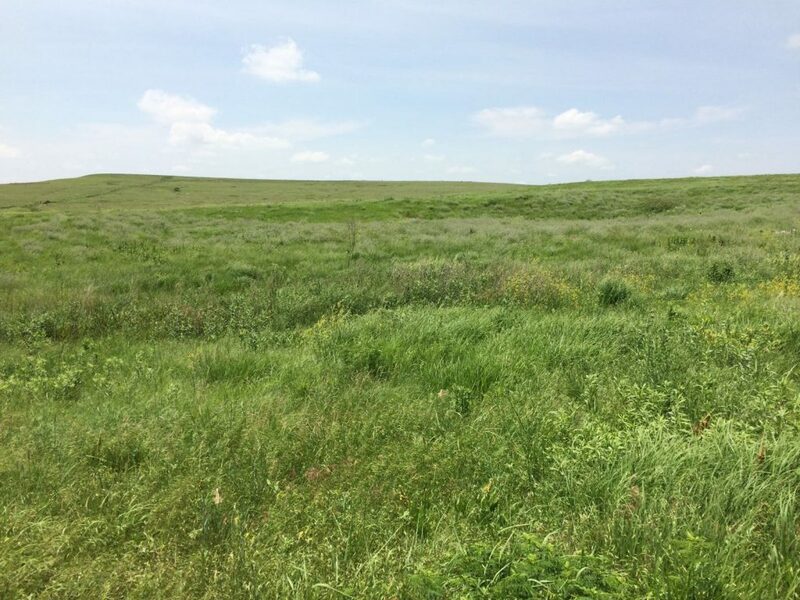 Just north of Manhattan, Kansas, in an area known as the Flint Hills, this little region is home to the last scraps of more-or-less open prairie land left in America. Once covering more than 140 million acres, only about 4% of it remains, and that last bit remains undeveloped not for lack of trying. 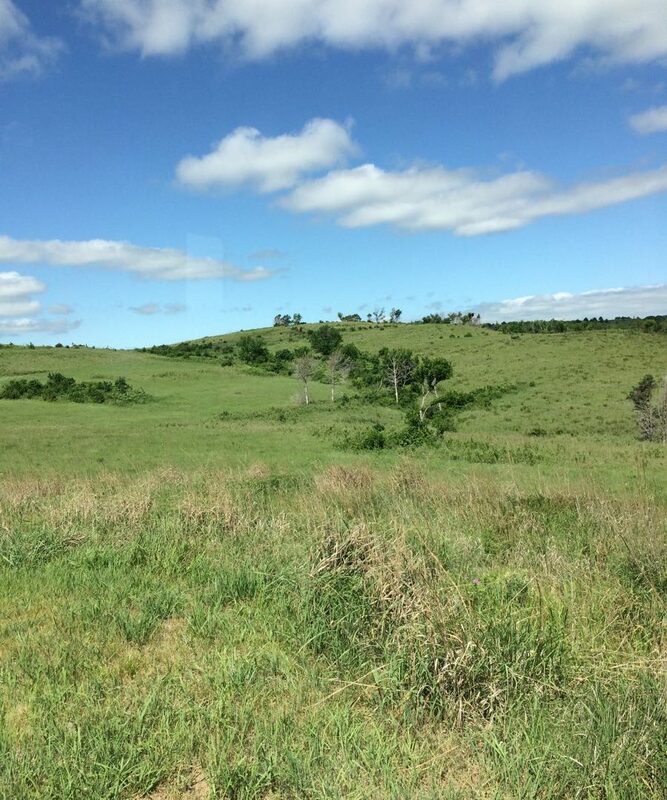 This area was once an inland sea that deposited layers of limestone, shale, and flint in the bedrock. As the softer shales eroded away, the hardened flint shelves were left behind, and though the soil is rich, it was too rocky to plow and so left largely uncultivated except by small hold farmers who made some small headway in the “bottomlands” between the hills, and more often by ranchers who used the land for grazing their cattle. 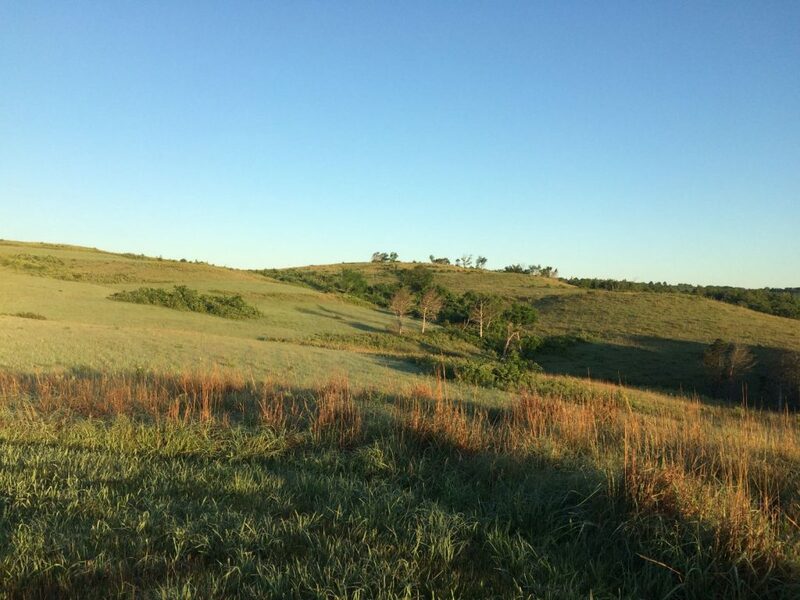 Tallgrass Prairie National Preserve was created in 1996 to protect just under 11,000 acres of this prairie. The land was donated from what had been working ranches and is now in the process of being restored to its wild(-ish) state. 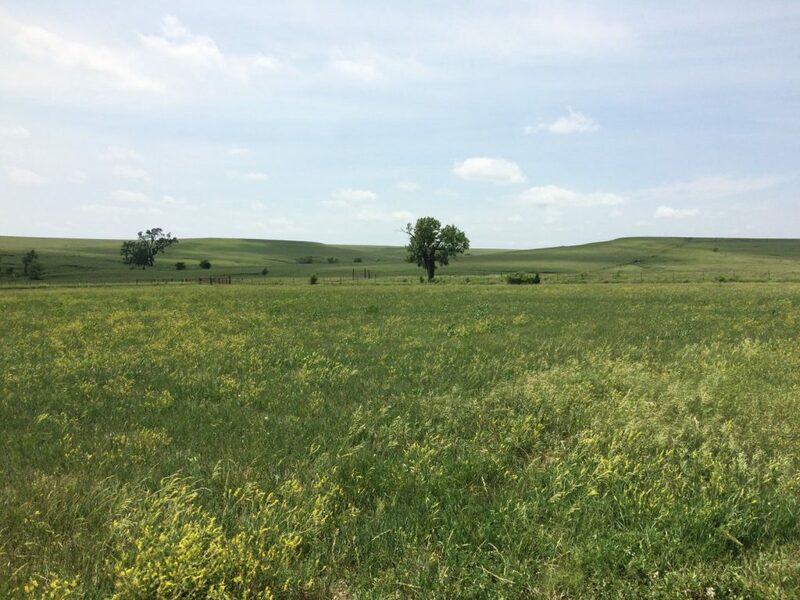 Among other things, they actively plant native wildflower seeds each year to help the natural spreading process, and have even brought in a small bison herd to graze. I came out here specifically to see this. 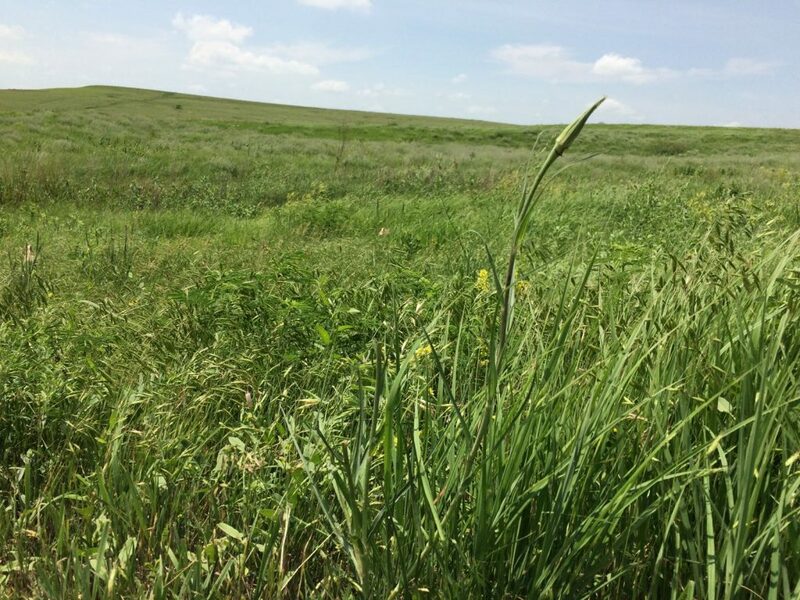 I’ve driven through plenty of Kansas and Nebraska in the last few years, and naïvely expected to see at least some of the waving tallgrass I’ve read about in books and historical sites. Alas, it was mostly corn. Cow corn. Or soy beans. A few other crops, but all cultivated rows of cultivated crops, no wild open range. My grandfather was a real cowboy back when there still were such things, and he would search in vain today for the land he knew. Corn is good. I understand its economic importance and can hold that alongside a sentimental longing for wild open spaces. Which is why I came out here. 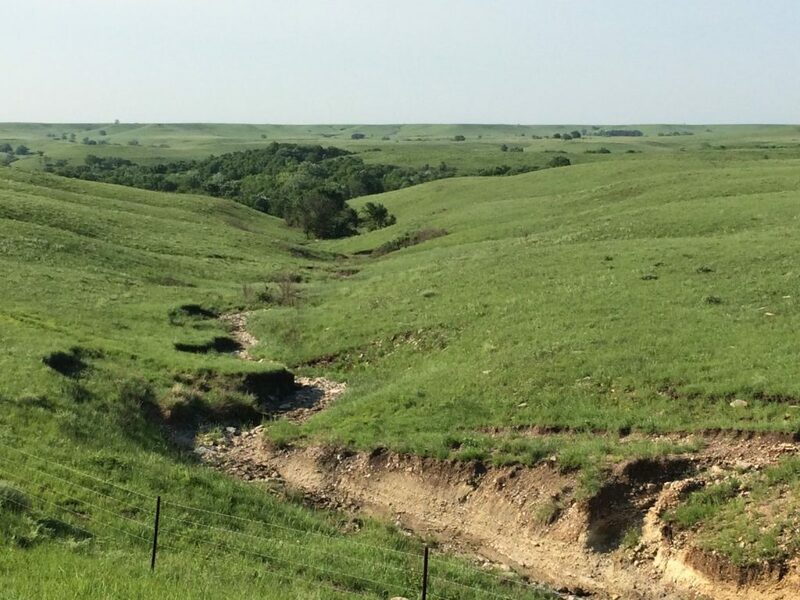 Highway 177 is one of America’s Scenic Byways, a short stretch of a little over a hundred miles through the last of the open tallgrass prairie. 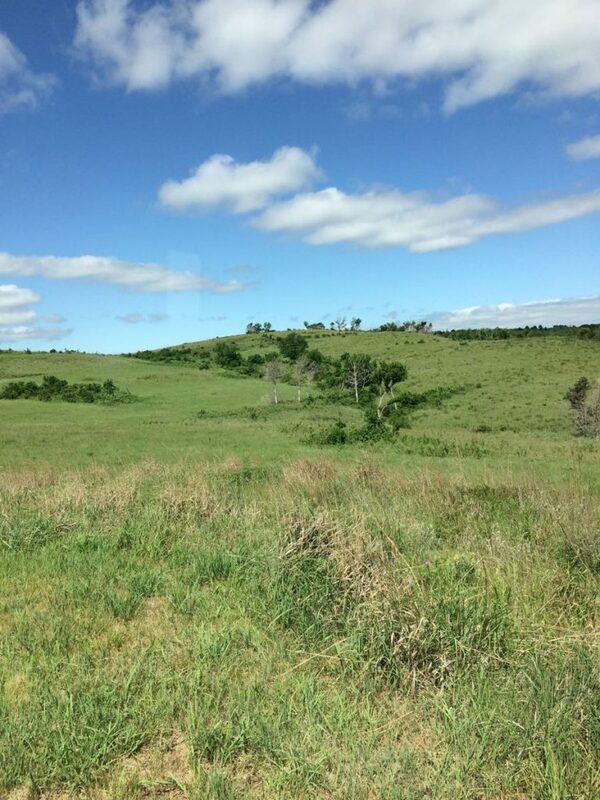 Even the part that isn’t the nature preserve, though private, has largely been used for grazing and not much farming because of the rough flint hills, so it still looks gorgeous. 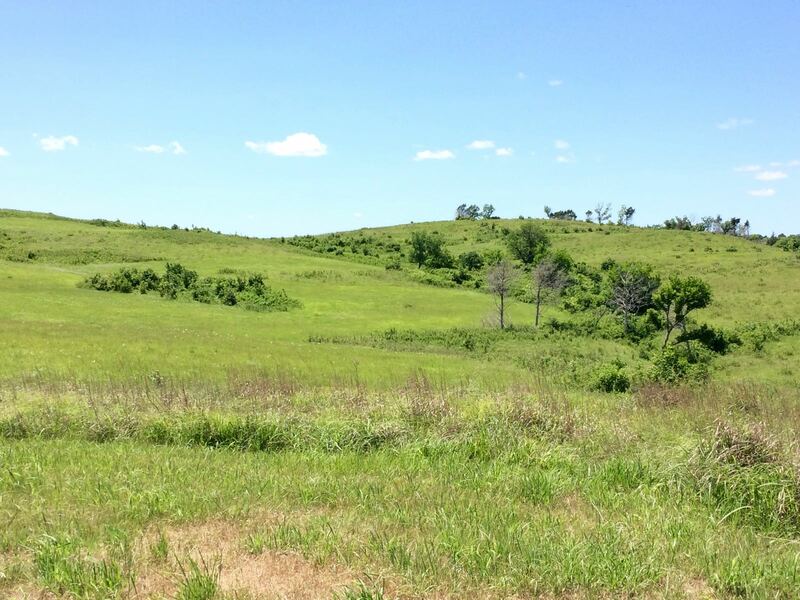 Out on the trails in the preserve, the hot wind whipped my blue cotton dress around my legs as I twirled, arms upraised to the heavens, imagining myself a settler encountering the virgin prairie for the first time. It is more beautiful than I ever imagined. Stories and pictures and nine seasons of Little House on the Prairie failed to paint in my mind the subtle and rich beauty that is in these grasses, and I am going to fail you just as thoroughly as my predecessors did me. There are layers upon layers of dense foliage here, with not one but multiple species of tallgrass interspersed among each other, with shorter grasses blanketing the ground in a deeper green hue, patches of different wildflowers on display every few feet, and quail, rabbits, and fleets of grasshoppers and butterflies popping out of the tallgrass in unexpected places. A bird perches upon a single, stiff blade of grass, then flies off again. The startlingly white cotton-puff clouds overhead sail through the deep azure blue of the sky. As the variegated greens of the grasses sway in the strong wind, they seem to shimmer, but they don’t surrender to the force of the wind. These are strong grasses, used to the constant barrage of the air and the sudden torrential downpours that this region is known for. But the grass is just as strong. It grew up in this land and it stands tall. And in every change of light throughout the day and dusk it looks new. In the dim light of dawn the grass is a pale, mossy green, turning almost yellow as the first rays of the sun light up the morning. Within minutes it looks as if it is on fire with the light reflecting off the dew. A short while later, with the sun higher overhead, the green comes out once again in a color that I can only describe as what you would get if an emerald jewel were fluorescent. A yellow butterfly dances around the emerald stalks while purple, orange and white wildflowers beckon it closer. The sunset brings shades of auburn to the patches of trees clustered in the rocky ravines that fill in the cracks between the hills, the so-called bottomland. Swallows swoop through the air, catching insects in mid flight, calling out to each other in a chorus of happy contentment. I look at the grass again and see something new, some new cluster of flowers or a variation in the patches of grass, a cluster of trees I hadn’t noticed before, or one or another variety of grass seems to stick out more as others recede. I’ve been staring at the same area of prairie land from my camping spot for two days as I write this, and still I see something new every time I look out the window or take a walk. There is far more here than pictures or descriptions can convey. My iPhone has a good camera, but is doing a terrible job of getting the details and the colors that I want to capture, and though a better camera would be in general a good thing, I don’t think any camera or artist could convey the at once subtle and intense beauty of this land. I have heard settlers’ accounts of the land, describing it as breathtakingly beautiful, and have always thought they were a little punch drunk; hardship often makes you feel more invested in whatever it is that you poured your blood, sweat and tears into, and those settlers faced a lot of hardships, spilled a lot of blood, sweat and tears. After all, what’s so great about a lot of grass? But today I feel like I could spend the rest of my life here and not get tired of this land. 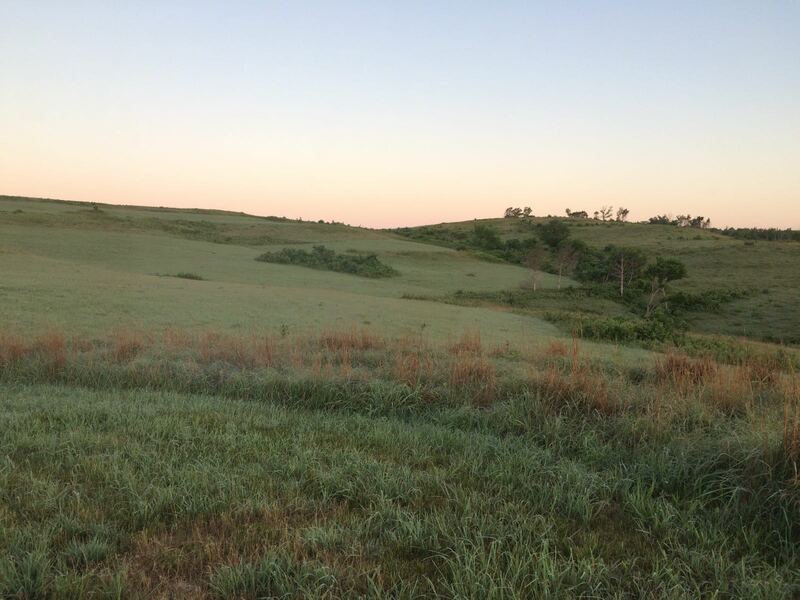 So I am here at Tuttle Creek, and the sun is setting as I write this, casting a brilliant glow of reds, oranges and almost yellow hues over the green hills and the fading blue-gray sky. Soon the stars will come out, which I will actually be able to see because the nearest cities and towns are small and remotely scattered, and so not a major source of light pollution. This is what I love about dispersed camping. This is precisely why I set up my van to be self-sufficient. I don’t need RV hook-ups; I make my own electricity from the sun and bring in and out everything I need. 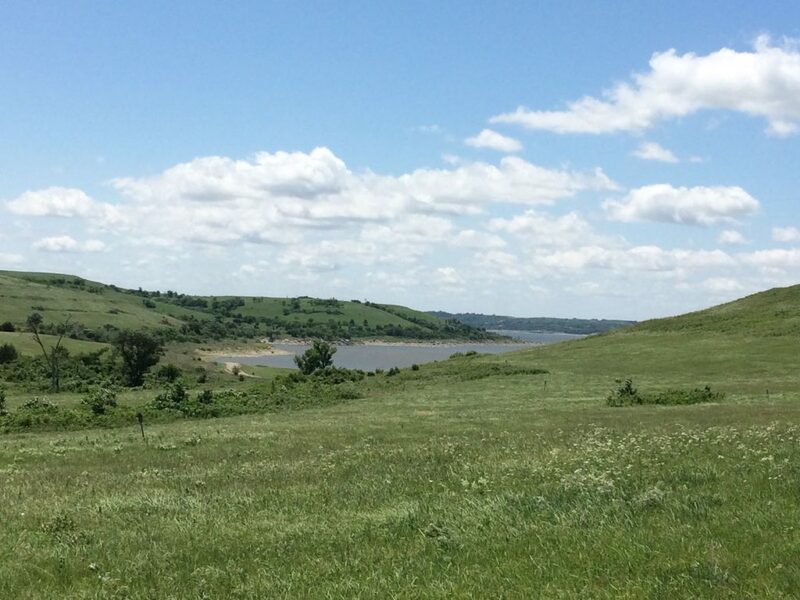 That way I can set up camp anywhere, even on the shore of Tuttle Creek Lake overlooking the water or up on the hill overlooking the prairie. And I can move to suit my fancy. The one thing I don’t have is internet—which is a good thing—so I’ll upload this when I get back to a town, but uncharacteristically I felt the need to write right away. I see a planet now, maybe Venus or Jupiter, shinning white in the deep indigo fading to black that is the sky, a few of the brighter stars are faintly coming out, and the fireflies are starting to twinkle. Cicadas are waking up around me as the birds settle down for the night. 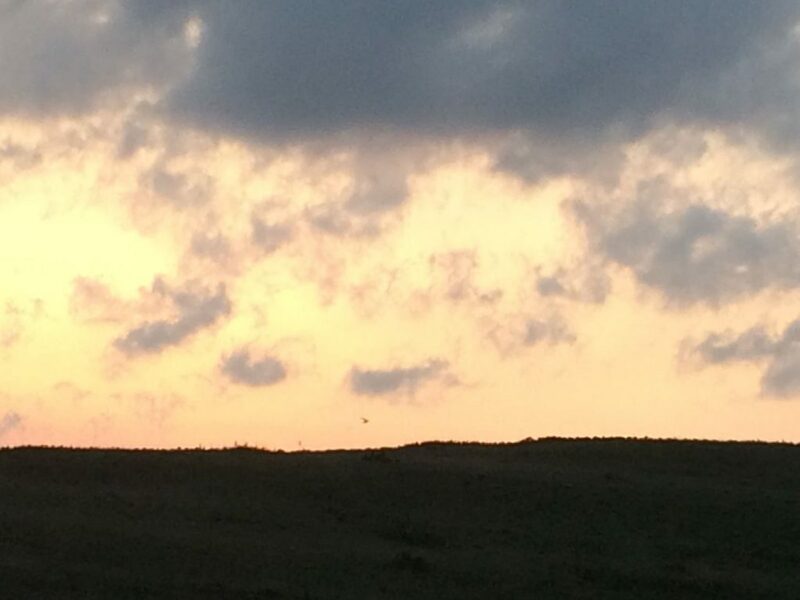 In the distance, a lone coyote calls out. I’ll put the computer away in a minute and finish my dashboard-warmed sun tea while watching the light show in the heavens as the sky fills with stars. I’ll spot the Big Dipper, use that to find the North Star, and feel that all is once again right with the world. As my body naturally gets sleepy, I’ll turn on one small light for a few minutes to take care of my evening routine, then crawl into bed and fall asleep looking up at the stars. The sun will wake me with the dawn. I love reading your stories. You paint a beautiful picture. It’s as if I am sitting right beside you drinking a glass of sun tea. Love you! 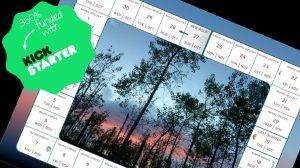 Previous Post 14,174 Miles • I Survived Tuttle Lake—What Did You Do Last Night?